Designed for small to medium sized businesses, multiple floor offices, commercial locations and branch offices, the GWN7600 is a mid-tier 802.11ac Wave-2 WiFi access point. It supports up to 1.27GBps, over 450 concurrent WiFi clients and up to a 165 meter coverage range. To ensure easy installation and management, the GWN7600 uses a controller-less distributed network management design in which the controller is embedded within the product’s web user interface. 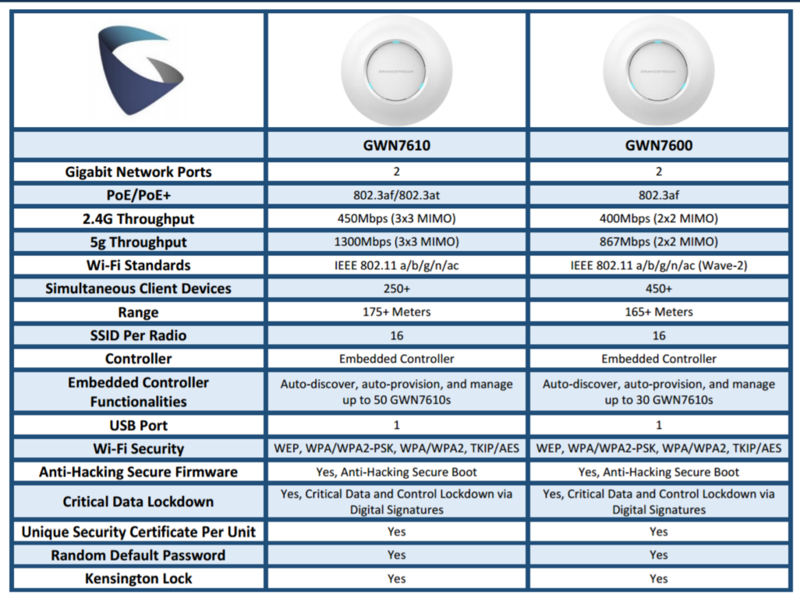 The GWN7600 is a mid-tier 802.11ac Wave-2 WiFi access point for small to medium sized businesses, multiple floor offices, commercial locations and branch offices. It offers dual-band 2x2:2 MU-MIMO with beam-forming technology and a sophisticated antenna design for maximum network throughput and expanded Wi-Fi coverage range. To ensure easy installation and management, the GWN7600 uses a controller-less distributed network management design in which the controller is embedded within the product’s web user interface. This allows each access point to manage a network of up to 30 GWN76xx series APs independently without needing separate controller hardware/software and without a single point-of-failure. This wireless access point can be paired with any third party routers as well as Grandstream GWN series routers. With support for advanced QoS, low-latency real-time applications, 450+ concurrent client devices per AP and dual Gigabit network ports with PoE, the GWN7600 is an ideal WiFi access point for medium wireless network deployments with medium-to-high user density.